As much as I’ve given music recommendations both written and verbally, I’ll always keep an ear open when someone has a suggestion. But initially when Ramsey & Issah tried to put me on to Loaf Muzik, I didn't take heed inexplicably. It’s when I heard a clip of their video via a Duck Down cross promotion that I took time to see what the hype was about. I’m glad I did because I didn’t walk away disappointed. 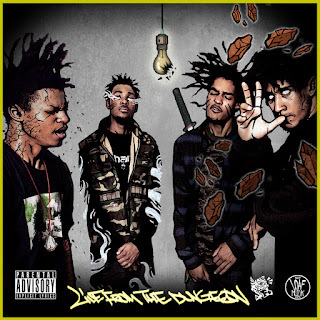 I’m always clamoring for young artists to embrace the organic roots of Hip Hop culture from yesteryear and that’s exactly what the Brooklyn quartet did on their mixtape Live From The Dungeon. The title track best exemplifies Loaf Muzik’s style. Mr. Green laces them with a beautifully multi-layered beat that fits their vibe quite well. The song is the epitome of basement rap, as it feels very authentic and sincere. I’m getting Rawkus vibes from this song both lyrically and production-wise, like it could’ve been on Soundbombing 2. They kind of rehash this same style through the next few songs, which is a gift or a curse depending on your palette. Turn Off My TV changes things up a bit as it alternates through a whispered chorus and louder, distorted verses over a prominent snare drum. Singer Hadassah guest stars on Percasets which takes a contemplative and slightly trippy tone, which continues on the next song SmokedOut Convos, although the latter is more uptempo. Hoopty Muzik is aptly titled as it makes you feel like you're in your friend’s car cruising with no particular destination, just chopping it up and rapping. Expensive Shrimp is very suave and caught me by surprise as I didn’t think Loaf Muzik would get down with that type of instrumental. They make it work without compromising much, adding a new sound to their arsenal. Entrapment is an intriguing experiment as it combines a sample with more modern and upbeat drums. It’s good and the strings are especially exquisite but it seems like it was mastered oddly as the levels are very uneven throughout the song. It’s a good concept but the engineering takes away from it somewhat. Uzi Butter is a huge stylistic departure as they go for a more southern sound which features gun-infused lyrics. Doesn’t fit with the rest of the project but then again breaks up some of the monotony. The same can be said about Nah Mean, which is less successful. Shinobi Warz has an Asian feel which might draw Wu Tang comparisons but it’s definitely Loaf Muzik’s own brand of hype on the penultimate track. Sunday Nights is simultaneously fast paced and melancholy. It’s a great ending track that asks the question “What we gon’ do now?! ?” in the chorus. That’s as good of a question as any to ask about Loaf Muzik. They show great potential throughout their debut mixtape. However, they make their share of rookie mistakes. They're at their best when using the 90’s musical aesthetic, which makes the inclusion of a couple of the more trendy sounds quite puzzling. At the same time they’re still fine tuning their sound, as you may notice multi-track stretches where the songs have the same tone. I feel like this could have been solved by shortening the length from a sprawling eighteen tracks to somewhere in the 12-13 song range. To the untrained ear they’ll draw Pro Era comparisons. But whereas PE is built on individuals forming like Voltron as needed, Loaf Muzik is a classic case of the whole being greater than the sum of its parts. As time goes on, the world will become more familiar with Oso Dope, Kidaf, Shadow The Great, & Shine Sinatra as individual artists, but as of now they’re very group orientated. Despite still learning on the fly, Live From The Dungeon is a very promising start from a crew that has incalculable talent and is only scratching the surface. As far as a debut mixtape from a group you can’t ask for much more than this. Loaf Muzik represent NYC Hip Hop more than adequately and will be a force to be reckoned with as they continue to put things together.